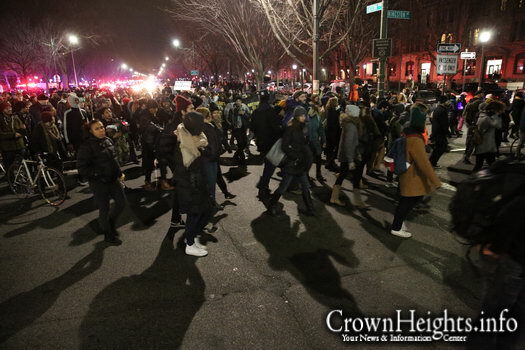 Around 2,500 people protesting loudly against police brutality are marching eastward down Eastern Parkway, and will imminently arrive in Crown Heights. 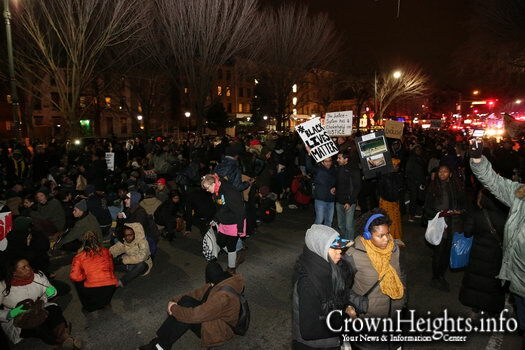 The protest comes in the wake of the death of Eric Garner in Staten Island, and a grand jury’s subsequent refusal to indict the officer responsible. 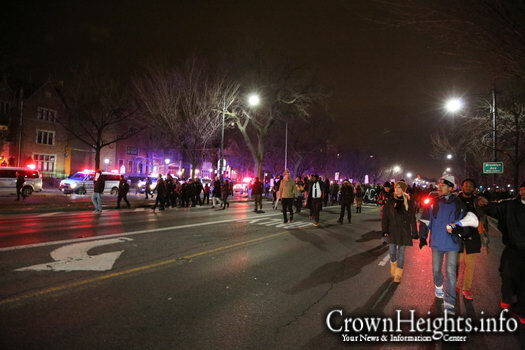 Though the protesters are accompanied by several police officers, please exercise extreme caution and remain indoors unless absolutely necessary. 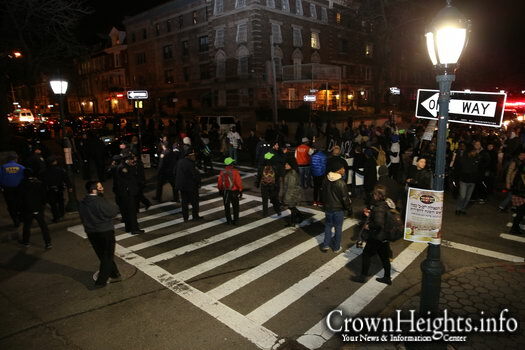 Update at 9:28pm: The group made a left turn on to Kingston Ave. and is heading north – away from the main Jewish area of Crown Heights. The NYPD placed 770 on lockdown while the group passed as a precaution, not allowing anyone to enter or exit. 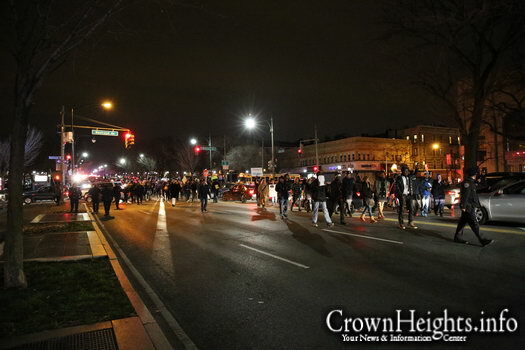 Update at 9:35pm: There appears to be a second group of protesters heading eastward down Eastern Parkway towards Crown Heights. 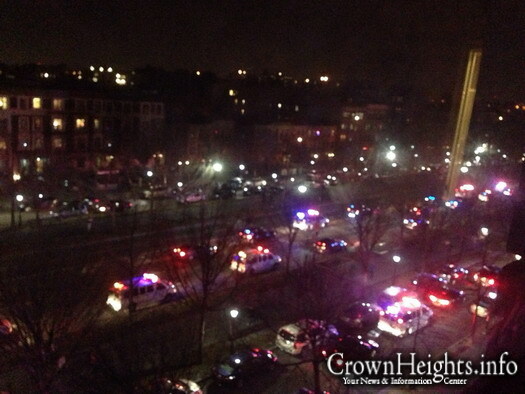 The NYPD and several Shomrim volunteers are at the scene and on alert. 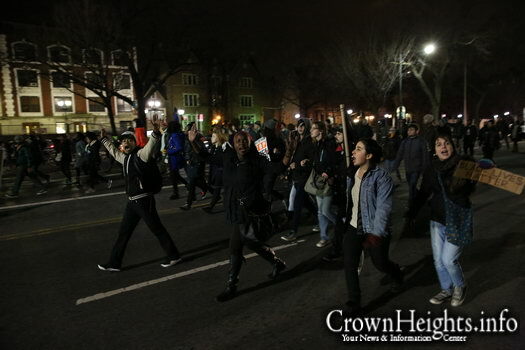 Update at 10:00pm: A second group of around 150 marchers passed through the neighborhood without incident. 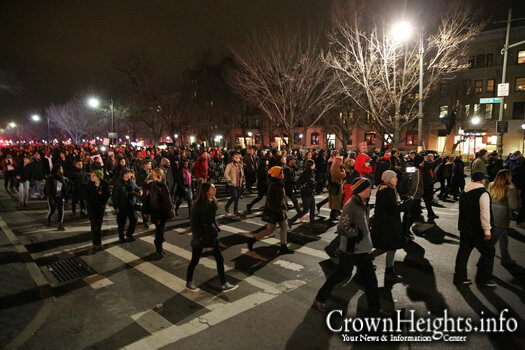 They continued along Eastern Parkway until reaching Utica Ave. Police are leaving 770, and said they don’t believe there will be any other protesters in the neighborhood tonight. 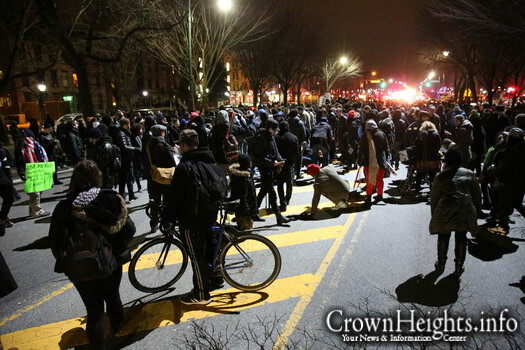 Final Update at 10:26pm: The second group of around 150 protestors joined up with another group of around 300 protestors and appear to be making their way towards the Pink Houses, the projects where an NYPD rookie shot and killed Akai Gurley, which is located in the East New York section of Brooklyn. 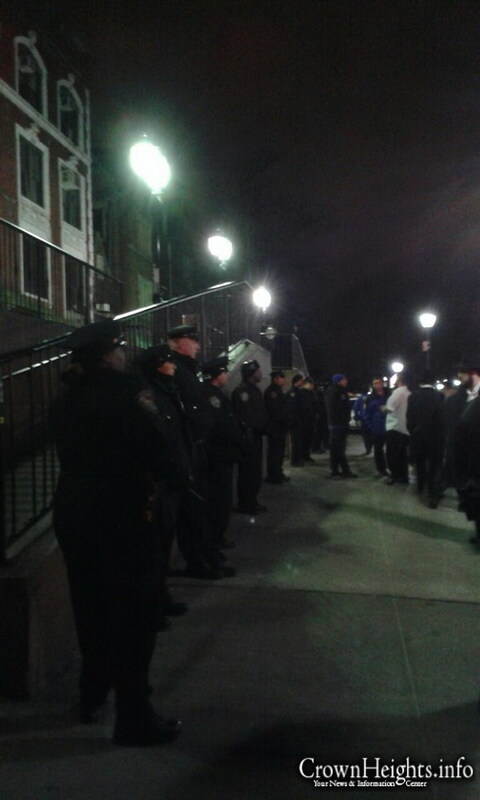 Police have cleared out from 770, and just a handful of officers remained behind. 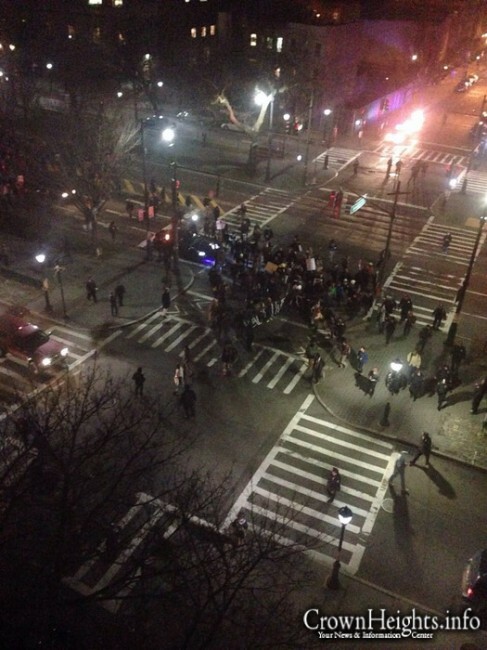 are they protesting what happened in 770 ? 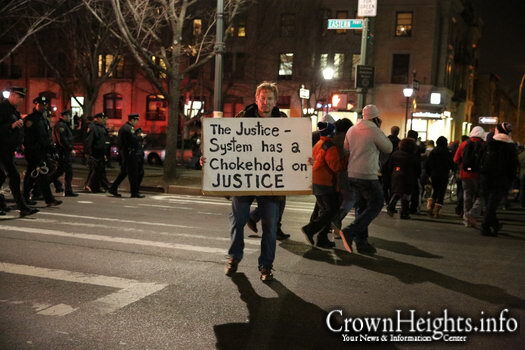 maybe all the bochurim can come out and protest that…. No. They are not protesting that. Of course they are protesting that. They aimed for a heavily populated, jewish area. Did they stop here. No. So if they aim for Times Square what is that call. Smart one. You need to relax. Don’t exaggerate. They were aiming for 770. Dont be fooled. You don’t even live in C.H. 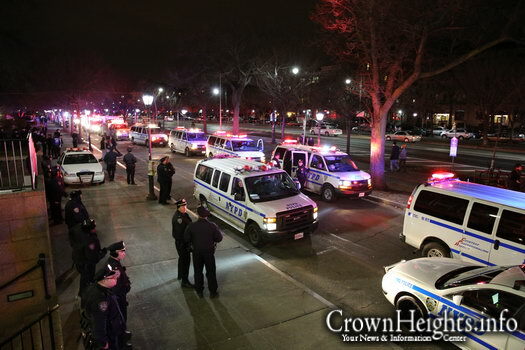 Wow last time this happened was the crown heights riots under the last democrat mayor, Mayor Rudy were are you!?? Am I the only one getting a flash back? Palpitations and all. These comments reek of paranoia victim complex. Yes you are the only one. 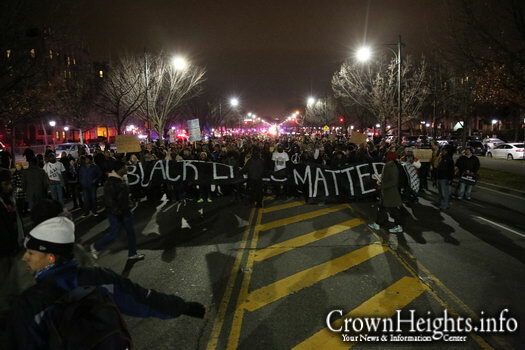 What the heck does the death of Eric Garner have to do with protesting in crown heights!!! People are seriously loosing their marbles!! 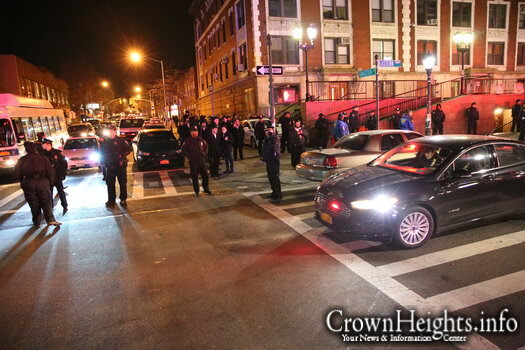 In any case, I commend all the police in crown heights for doing a great job of protecting us Jews in c.h!!!! When will George Soros run out of money to fund this malarkey? Bunch of losers! Don’t they have anything better to do on a Saturday night? Let’s hope for bad weather the next time their grand tour includes Crown Heights. Follow the money…. and you’ll find who is behind this. I was out there, maybe 100 protestors and three hundred police. 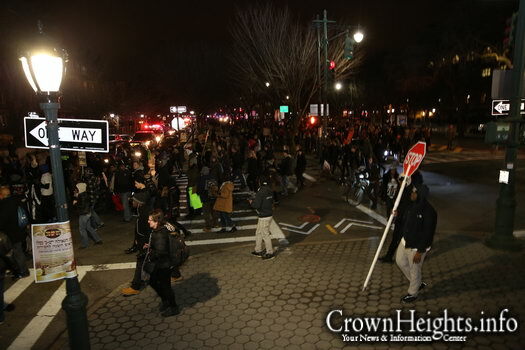 A regular protest like the ones that happened in the city, they’re happening to pass through crown heights. Quit the drama everyone. This is your OBAMA “Justice Department,” headed by Eric Holder. This is the society that a black president and a black Justice Department head have wrought. So think about this the next time you go into the voting booth! Of course all lives matter!!!! But if you’re serious about your sign that implies that you think some people don’t believe in what your sign says, I suggest you work with the African-American community from the inside, on the fact that more than three-fourths of all abortions (R”L) in New York City are of African-American babies! This is a case of Black women believing that Black lives DON’T matter, G-d forbid!. Now that’s a big problem! And this is exactly what WHITE Margaret Sanger was hoping for when she started “Planned Parenthood” — that poor minorities would have fewer babies, even if they had to abort them! Because of the genocide that abortion-on-demand has wrought among the African-American population, none other than Martin Luther King, Jr.’s niece, Alveda King, is a Pro-Life leader. Of course ALL lives matter, whether the African-Americans who abort their babies agree that “Black Lives Matter,” or not. Police brutality and lack of police accountability affects us all. Do you want to live in a country with a corrupt justice system? I certainly do not. What stupidity. There were grand juries, the grand juries found that there was no reason to bring charges. That’s the same system that is used for everyone. Both of those guys would still be living if they didn’t decide to attack police officers. Thank you police for a job well done. 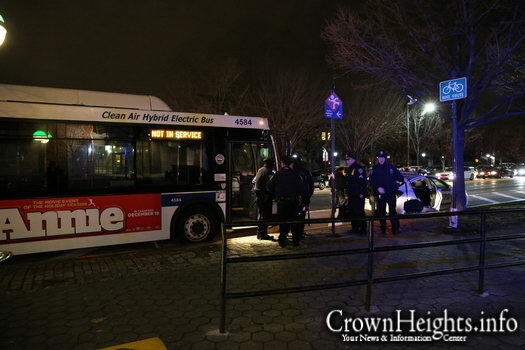 We’re still shaken up enough from what happened Monday night. 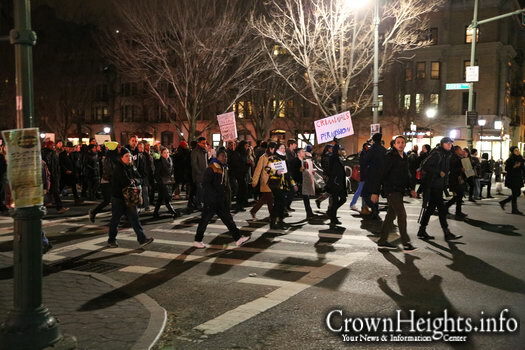 I wish there were a way to prevent these protests from coming into Crown Heights. The attack Monday wasn’t our fault, and the skin color of the perpetrator has nothing to do with us, plus it’s not our fault he was killed. For these people to march through our neighborhood is purely antagonistic. How quickly “you’ve” forgotten how terms like “these” people lead to your extermination. How naively comfortable you are to assume that you, a non white person would actually own a neighborhood. The day this system decided to remember that they don’t like “your neighborhood” and “your people” those police officers that your thanking will have an open field day. Shorim is only allowed by those officers that your grateful too. Don’t confuse your concentration into one area as separation or as being special. They’re just keeping you in one area like all the other minorities. Some of you need to fresh air. 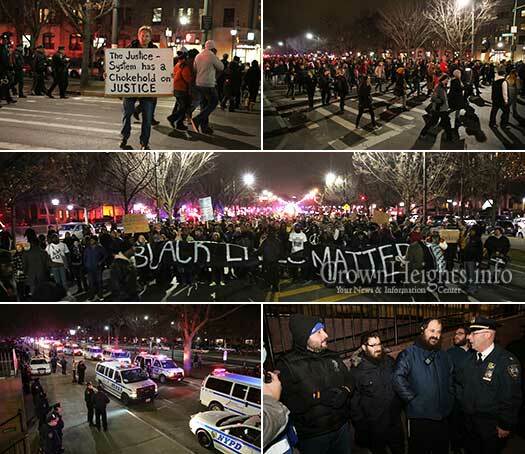 From these protest in NY I see more white and other races than black protesting. If they wanted to walk through any neighborhood they can you can’t stop them. They couldn’t care what happen at 770 which is not an injustice. 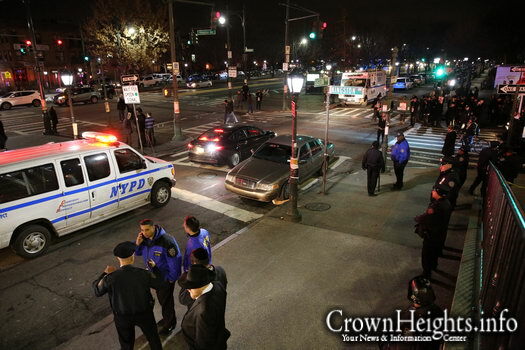 You know what happen to a Jew here in Crown Heights, just imagine if there was no cameras in that situation. Just imagine. 7. instead of their idols, they BELIEVE in HASHEM. But then, they would be righteous Bnei Noach, and that’s not as much fun as being a lemming, and letting their kids be wild animals who get shot while threatening the police, or in gang wars, or play 20 questions trying to figure out which creep is really their father. But hey, they get to march and yell all night long for weeks on end, terrorizing decent people who are put under lock-down for safety’s sake. We need tougher laws, not less law. I agree with what was stated, the blacks are anti-Semitic and I wonder if CAIR and that bunch are encouraging/funding this little venture and these animals to be anti-Semitic. I will say this much; they are no better than a Palestinian..hey, we have a black muslim in office in DC- what did you expect?.. 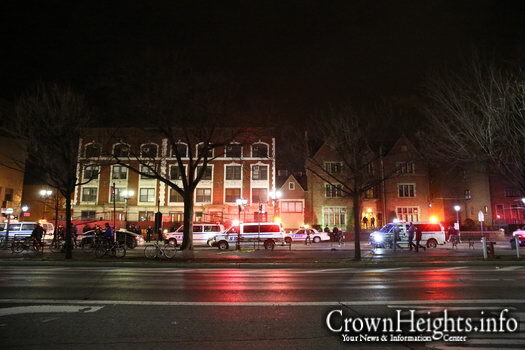 770 did nothing wrong, CH did nothing wrong and they are bothering us, a black man stabbed a young man and a rabbi tried to save the perps life by standing between the police and the perp.. so, now what? 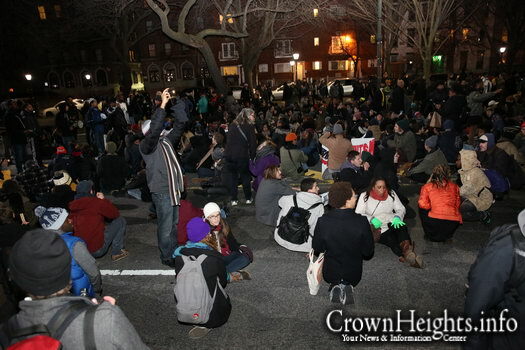 and it was all caught on video..inside 770…..these protestors are crazy and are ignorant, they don’t know anything! 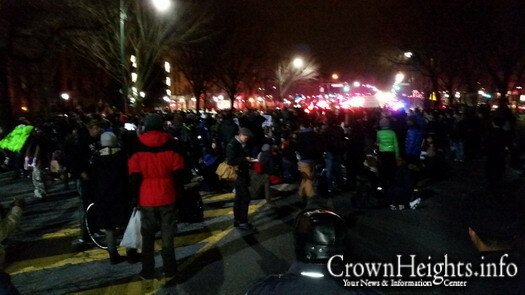 Thank you to police for protecting CH- its appreciated thank you again. B”H! 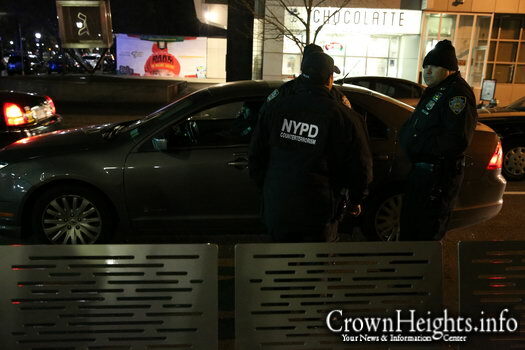 The Rebbe himself said that Chabad houses should be open at all hours. 770 is the holiest place in North America. You wont find anything holier than 770 unless you go to Eretz Yisroel..it needs to be open for Jews in need. and closing it wont help, theyll aim for a different place instead. By making this about “black lives” and not about police brutality because the NYPD are thugs and will do what they please they uninviting regular, non-black folks. and then we should also close 770 in the day time … so the jew hater can win!!!!!! 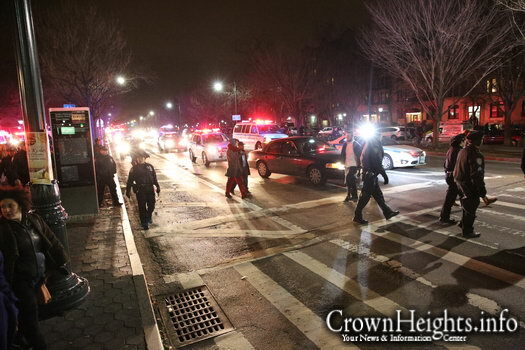 they were not marching through crown heights because of the incident that happened here. There have been marches and protests across the country because of numerous cases of police killing people and not being held accountable. This had nothing to do with the 770 incident, and there has not been any real backlash. 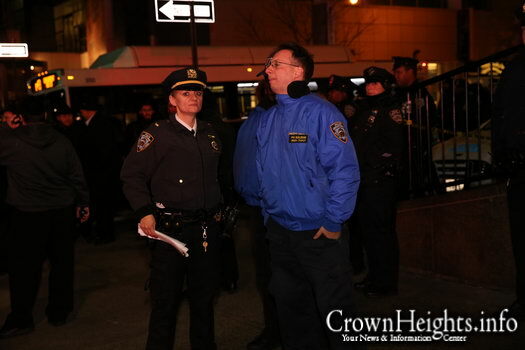 The police dealt with the situation well – only shot was fired and the guy was armed and intent on causing harm. WW2 The same thing happened to Us and we were taught everything that you mention but it still happened so what is your point or did you forget. Number 17 we agree with you 1000 percent . There should be a communal vote on this. Why do black lives matter but Jewish lives don’t? 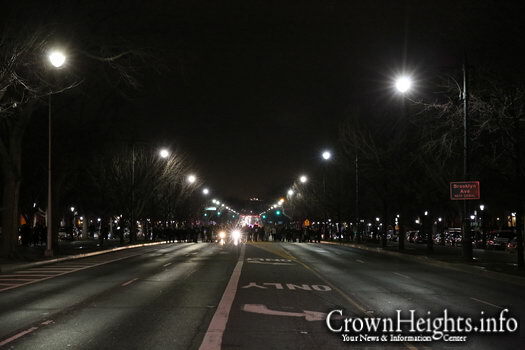 It’s these marches that almost caused a disaster in 770 last week because the police were too afraid to shoot when only Jewish lives were in danger, and only shot when THEIR own lives were danger. 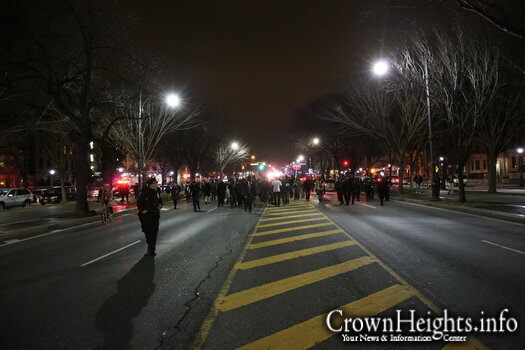 The comments and posts this event generated is a testemint to how close minded and racest Crown Heights residents are. Granted that there is sort of a resemblance to a situation years ago that got very ugly. Granted that when mesuring the comments here and FB, one can only draw a parallel with YouTube commentors… Its still quite shocking and disgusting to read the words that spew from you peoples mouths! You hypocritical Jew-hating sycophant (and Troll). “You people”?! Take your sick anti-Semitic rabble elsewhere! You and your ilk are not welcome here! And yet 95% of Jewish/black violence if by blacks against Jews. And the only ones who stop that are the police. I protest against the Garners and Martins and others who decide to assault people who bring law & order to our streets. They wouldn’t have died if not for the fact that they broke the law and then started violence over it. “You people” is a way for me (a black hatted CHer) to separate myself from those of you who are so close minded, you cannot realize that you have become as racist and sick as those you dislike. Do you not realize that someone was arrested with acceseive and illigal force and he DIED? Do you know what the difference between this case and the guy arrested at ALIAH is? The guy at ALIAH thankfully was only hurt, not killed. What did we do when that happened? We staged a protest exercising our right to free speech! 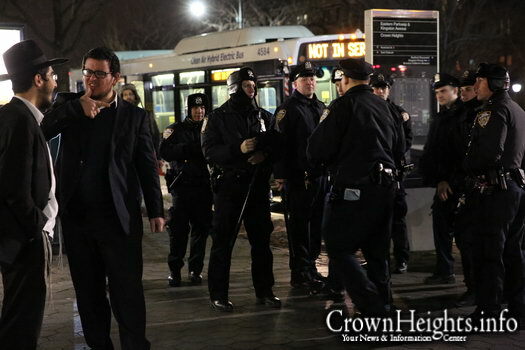 Now when a group of mixed race protesters pass through CH in similar protest, you think its OK to make it a Jewish issue, call them pigs and the like, and suggest that the Rambam says that they should be killed for hurting Jews! The pure hate that is leaking out of YOU PAEOPLE both on public news sites and Facebook is an embaresment. YOU PEOPLE should be ashamed of yourselves. End your double standards. You are frothing at the mouth, trying to spit out your anti-Semitic babble as fast as you can. You are a troll and the closest thing are to this community is perhaps you living within its confines and that you in fact wear a beard and a hat, but that is where the similarities end. I believe the expression for you is a pig wearing lipstick. Carry on… Continue separating yourself away… And in fact, please stay away! Come off your high horse. You sound ignorant and arrogant at the same time. And stop using words so loosely. 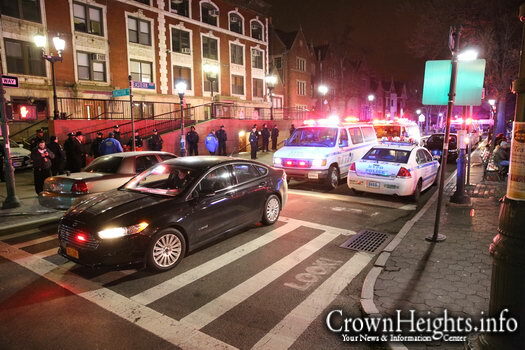 I dont live in crown heights… but i value the lives of my people. 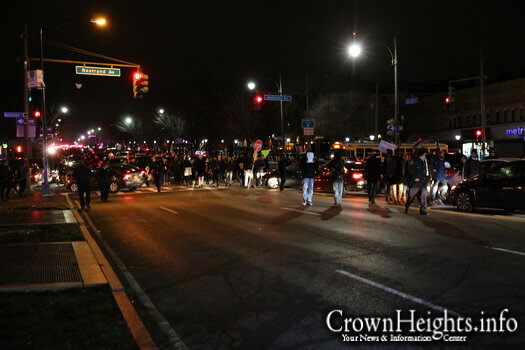 There is a protest coming: Tonight, as I passed by Kingston Ave. on my way to the train, I saw lines of police officers surrounding both sides of the street in front of 770. When I asked about what was going on, I was told that there would be a protest that would be passing by. Having understood, that those who were marching were expressing their outrage with regard to police brutality, and the unjustified use of force used by officers across the country, which has led to not only deaths but also to unlawful harassment, detainment, and imprisonment of innocent people every day, I found it strange that the object of disapproval was concentrated in front of one of the places in the world that I love dearly. For those of us who have not been to a protest: cops typically excite the crowd, and in this case especially, they embodied all that is rotten and wrong. They could have very well served as targets for frustrations vented. More disturbing was the fact that officers were telling people to “go inside” or “go home”, “there is a protest coming”. 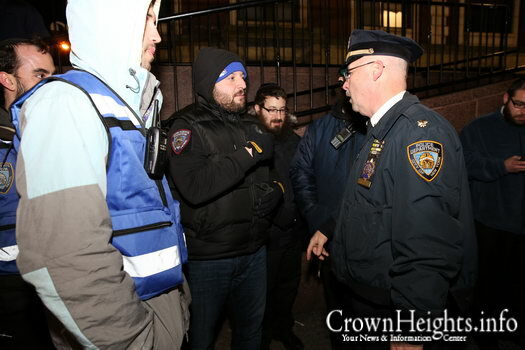 As men in uniforms successfully corralled unassuming Jews, I loudly said, “who speaks english?” as I often do, when I am looking to have a conversation at 770. A man looked at me, so I asked him if he speaks english- the bochurim looked at him, and looked at me, he looked at the bochurim, and looked at me, and nodded affirmative. As we began our discussion he seemed to think that the protest was against white people, and I thought to remind him that this was not the case, and that not too long ago a man was shot inside 770, and there was no reason for that to have happened. In reference to the video of the incident, I mentioned how the cop had ample opportunity to take the perp. down, after he had relinquished his knife, and that he had failed as an officer. He agreed, apologetically adding that “the officer was poorly trained”. Finally, he admitted that most cops are bullies, but that I had not lived in New York for long enough to know what I was talking about. As the marchers came and went, I was disappointed that only a handful of people were able to see a demonstrator walking her dog, as she motioned for us to join her. —- I am not encouraging anyone to go and protest, and there is no denying the blatant anti-semitism harbored by many activists (activists are people too)- I truly wish this wasn’t the case. 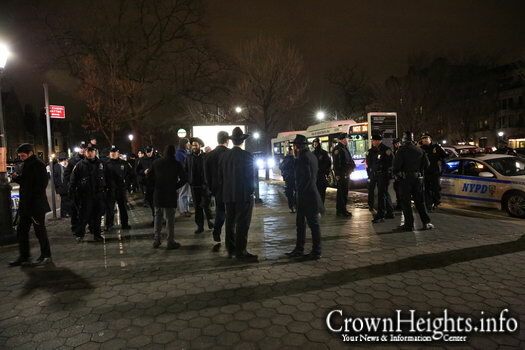 However, whether we like it or not, police presence and behavior is something that effects all of us, and it is not something that necessarily depends on our behavior (see video of man getting beaten in Crown Heights Community Center). If we allow ourselves to be ordered indoors, then not only do we stay ignorant of the environment in which we live, but we allow ourselves to be spoken for and represented by the very people who symbolize, in my humble opinion, the antithesis of what we stand for (see 16:50 of the PBA response to criticism of Eric Garner death, which I found to be utterly disgusting). Furthermore, I do not think it is in the sprit of rachmanoot to harbor grudges against our neighbors. After the attacks in Har-Nof, someone sent a letter to Hacham Yaakov Hillel שליט״א, in Jerusalem תובב״א, expressing their concern. He responded by referencing the Gemara (Sotah): “In the end of days, just before Moshiach will come, we will be placed in circumstances where we have no option but to recognize that we have nothing to rely on, other than HaShem.” The Lubavitcher Rebbe זקצ״ל said once that he hoped for a time when America’s melting pot would be so active that we would no longer make distinctions based on our ethnicities. He also made a point of reminding us that “America is no different”. 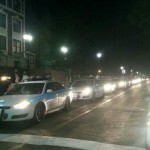 May we all merit to see a day without police barricades outside of our holy places, and next week may we make havdallah in The Holy Temple תובב״א, but only because we are paying tribute to a time when we used to have to make havdallah, and may we do so by a big big orchestra, and may there be singing and dancing, and may the torch be soo big and soo bright that we can all see its reflection without having to push, and mamash there will be soo much wax left in soo much wine after the light is extinguished, that the children will all run up and make balls of this mixture and hurl them at each other, and their mothers will get soo upset because it will be soo hard to get it out of their clothes.אכי״ר ah gevald. A GOOD WEEK!!! You need to refrain from commenting and get back on your meds. I’d like to see them try and protest thru Wiliamsburg. let them protest somewhere else not here why don’t they protest. We want free healthcare or why not protest whole wheat the children will need it anyways there’s nothing to bring home!?. “jury’s subsequent refusal to indict the officer responsible”. The jury did not refuse to indict the officer-they were asked to judge whether he was guilty of willful murder. Gurley was killed when he walked in a dark stairwell and the officer couldn’t see ahead of him. Guess why the stairwell was dark? Because the junkies steal the light bulbs. So the fact that he got killed was because of black residents stealing. The reason why all these protests are taking place is because the media is biased and does not cover stories accurately. 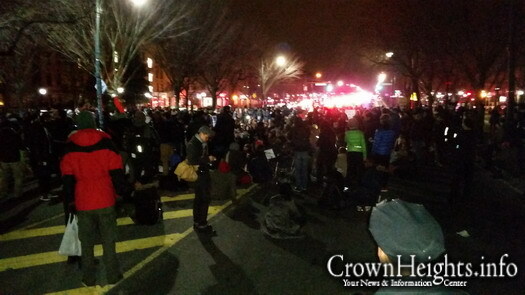 The media flares up people and causes them to have protests so they can have more news stories. Moshiach will be found even in the newspapers. the blacks act that way and deserve it! we arent racist against their skin color we are racist against their actions! it happens to be that blacks do much more/worse crimes than whites. WHAT ABOUT “MOMENT OF SILENCE”? Torah Commandment: Love your neighbor as you Love yourself. You have to look at it from both perspectives: in the jewish perspective- the black guy was mentally ill and was muttering the words kill the jews. The cop said to put doen the knife and when he didnt listen and charged at the police officer the officer killed him. From the non jewish perspective: they are always blamed for everything that happens and most of the times they are killed and put in prison and that is unfair. Now i am a jew and of course im not going to say that the jews are wrong but I am going to say that in 770 the policeman was way to quick to kill the guy i mean there was more than one police officer but they were all scared which doesnt make sense because they undergo alot of training and there were other ways to go about. Im just saying that the blacks are right and us jews have to be more sensitive because we both went through slavery and persecution. And the whole conflict with the arabs is a whole other story which i cant get into now. Most blacks are killed by other blacks, not white police officers! 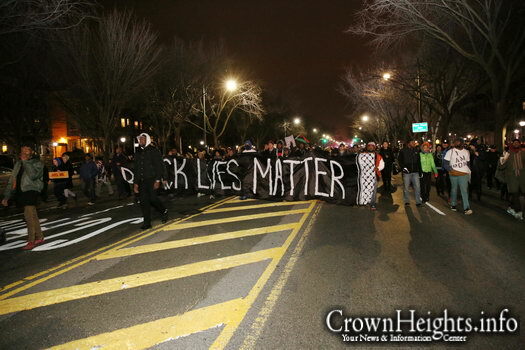 Where are the protest marches for black on black killings?